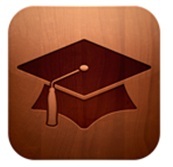 The most astonishing thing about iTunes U when it launched was the sheer number of universities and educators who offered their invaluable insight and knowledge to iTunes users for free. Despite all the paid-for campus-based education and Open University opportunities, here were a group of educational institutions with formidable reputations placing their brains down at the feet of those who wanted to learn anything from physics to philosophy and beyond. While the ‘U’ is of course also used by university students who had missed a lecture and needed to catch up, it also offers the general public free education in a multitude of subjects via computer or even iPhone. But the iTunes U experience has finally come into its own with the launch of the iPad App, which takes all the video, audio, written and image content and collects it into a course-specific binder for you to browse through like you would if you were sitting in the lecture hall with the genuine article. The difference between a ring binder and your iPad, however, is that the binder can’t play video or audio from inside its pages, or access courses from other universities, like Stanford, Yale, MIT and Oxford. It also offers the resources of institutions like the New York Public Library, realizing the full educational potential of a tablet. It has now become easier not only to be a student in full-time education, but to be one in addition to holding down a day job, raising a family, or even travelling, as those who have a 3G iPad can pull down new course information on the move. Previously, we’ve published an article about things you can do with your iPad. Tom Barrett’s 100+ ways to use iPads in the classroom will really help you create a fun digital play day with your students. It’s also an incredibly social learning experience, should you want it to be, and it’s this feature that those growing up around social media are going to be most interested in. Not only can you tweet some class notes but you can also send them to your friends via messaging and email from within the app itself, allowing everyone to stay on track, to discuss their last lecture, and to plan for the next seminar. Not a bad feature and one that’s going to prove vitally important when working on a group project or as part of a study group. Apple has always been passionate about education, so it’s no great surprise that something like the iTunes U app has come into existence. But to know that it offers such a wide range of educational materials — as well as fully integrated media, social sharing and of course, optimization for learning on your iPad — is exciting. Learning just became significantly more convenient and hands-on.